The Senate passed an almost $40 billion budget bill Thursday that included a provision banning single-use carryout bags at all retail establishments that are 3,000 square feet or larger, or have at least three locations in the state. The bag push, adopted by a bipartisan vote, is meant to make the state more environmentally friendly and was cheered by green advocates. But it drew an immediate rebuke from local retail groups, which worry it will erode consumer choice at perhaps 20,000 retail locations and hurt mom-and-pop stores in their battle with online merchants for customers. And Governor Charlie Baker telegraphed significant worry through a spokesman. The budget provision, which faces major hurdles before it could become law, would allow stores to make a reusable grocery bag or recycled paper bag available for purchase at the point of sale, but retailers would have to charge at least 10 cents per bag. Senator James B. Eldridge of Acton, a lead backer of the effort, said more than 30 of the state’s 351 cities and towns have already approved plastic bag bans. They include large cities like Cambridge and Newton and small towns like Truro and Lee. Eldridge said plastic bags are harming sea creatures and wildlife, and littering Massachusetts’ landscape. He said the proposal is sensitive to small businesses because it exempts all retail stores under 3,000 square feet, unless they are part of a chain. And it’s sensitive to consumers, he asserted, because it allows plastic produce bags and dry-cleaning bags. But Jon B. Hurst, president of the Retailers Association of Massachusetts, decried the ban as “bad public policy” for both consumers and mom-and-pop retailers. He said people go into retail stores to be served, and part of the service they expect is a bag for the goods they purchase. Hurst worried that the ban, if put into law, would lessen the advantages stores on Main Street have over online retailers like Amazon.com. “The local store is being put in a position of telling the consumer: ‘Well, you’ve got to pay me to get a bag,’ ” Hurst said. He emphasized he uses plastic shopping bags to line the trash bin in his bathroom and paper shopping bags to recycle his newspapers. And, he said, stores wouldn’t be offering plastic bags if consumers didn’t want them. He estimated that 20,000 retail locations, out of about 60,000 in the state, would be affected by the ban. Another trade group had a different take. 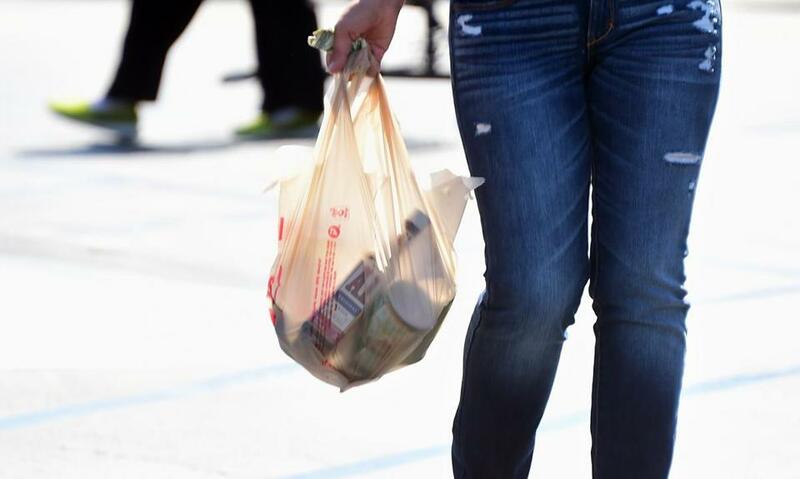 “Our board has voted to support a statewide plastic bag ban if it were part of a comprehensive recycling bill,” said Brian Houghton, the vice president of the Massachusetts Food Association, a supermarket and grocery trade group. But since this week’s push is not part of such a comprehensive effort, the association does not support it, he said. Jack Clarke, director of public policy at Mass Audubon, said just as retail groups cried foul about recycling measures that have been successful in Massachusetts for 20 years, so too are they worrying about the bag ban. Senator Brian A. Joyce, a Milton Democrat who has long been a bag-ban proponent, said he was delighted with the bag vote. Plastic bags are created from fossil fuels, he said, and are used only briefly before they become litter or take hundreds of years to decompose in landfills, releasing toxins. The Senate vote adopting the bag ban was 29-9, with some Republicans voting for it and some Democrats voting against it. The chamber’s budget will now be reconciled with an earlier House-passed budget in a committee that includes senators and representatives. Once they hash out a final package, it will go to Baker who can, among other options, veto it or sign it into law.